In the main Projects area of your site, click the options (three dots) button in the top right corner, and select Trash Can from the dropdown menu. 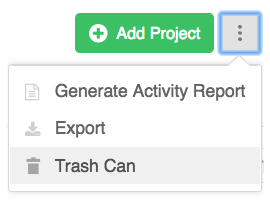 Next to each deleted project in the trash can, you see a button to restore that project. Before you restore a project, you can hover your mouse over it listed in the trash can to see who it was deleted by. Once projects have been deleted for over 30 days, they won't be shown in the trash can and they can no longer be restored. Note: Only Owner Company Site Level Admins can restore a project once deleted.